The 5" Clip-On Holster 0110 is perfect for a two-way radio, GPS, Treo, iPhone, Palm, Blackberry or anything else that's 5" or less in height. For fit, simply measure the height of your device (excluding antenna). 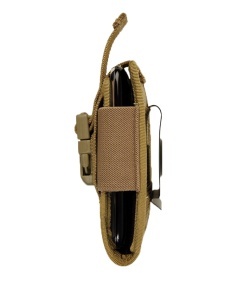 Maxpedition has added an elastic retention strap to accommodate variations in width and thickness. 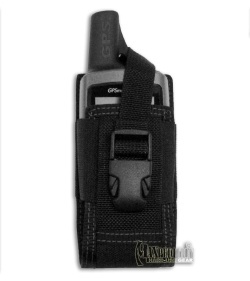 The 0110 Clip-On Holster comes with Maxpedition's heavy duty spring steel clip. It's pre-installed for quick and secure attachment to duty/rigger's belt, pants belt, waistband, pocket seam, backpack strap, etc. If you're not digging the clip, no worries, it can be removed and 3" TacTie™ (sold separately) can be installed for MOLLE compatibility.